﻿﻿﻿﻿ "Eat breakfast like a king, lunch like a prince, and dinner like a pauper" nutritionist Adelle Davis said. The most important meal of the day is breakfast, study after study has shown that eating a healthy breakfast can help with everything from improved concentration to higher energy to weight loss. While sumo wrestlers skip breakfast to gain weight, the rest of us should be eating breakfast to lose weight. According to Dr. Wayne Callaway, obesity specialist at George Washington University, skipping breakfast can not only trigger overeating later in the day but can also cause a drop in metabolism. Eating a healthy breakfast is key. 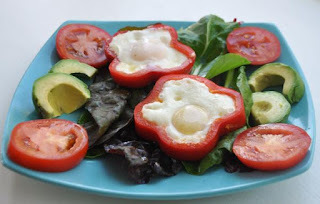 A recent study found that people who ate two eggs (protein) for breakfast lost 65% more weight and reduced waist circumference by 83% more than people who ate a bagel (processed carbs) for breakfast (Pennington Biomedical Research Center). 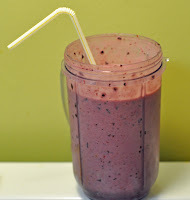 We love using our Magic Bullet blender because of its quick and easy clean up, but any blender will work. Click here for more breakfast recipes. *Jarrow whey protein powder is available at your local health food store or Kehres Health & Chiropractic in vanilla, chocolate or unflavored. To order contact Dr. Kehres at 989-607-4322 or drkehres@kehreshealth.com.